Our 2018 questionnaire (PDF) measures respondents’ tenure security by posing nearly 60 questions in six core modules (two additional front-end modules capture details on respondents’ key characteristics and record permission to use their data). To contextualise this, we collect a range of additional data through the questionnaire designed to capture robust information on individuals’ tenure situation, as well as key individual and household characteristics. 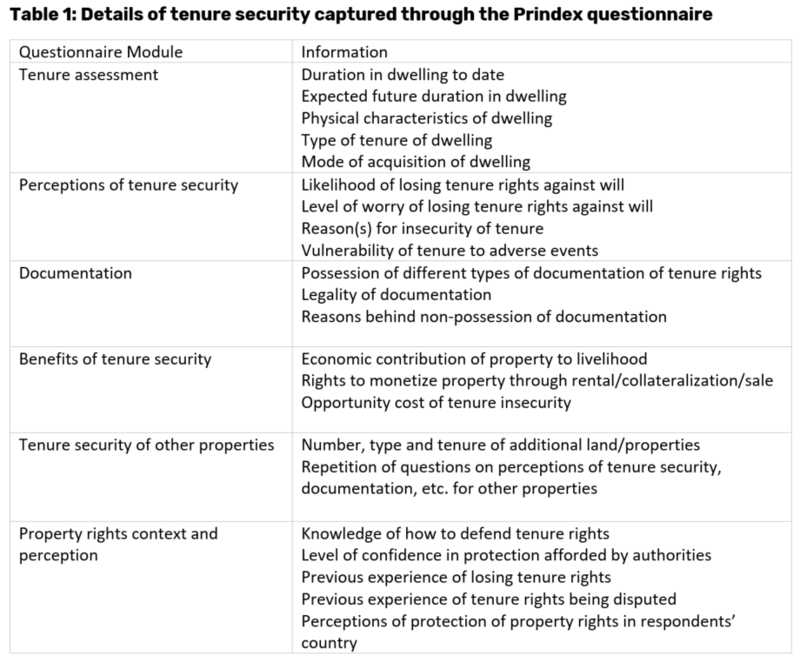 Key areas of enquiry (Table 1) include information on tenure rights the respondents have over their main dwelling, respondents’ perceptions of their tenure, documentation of tenure rights, benefits conferred by tenure security, tenure rights to other properties and tenure security of these, and experience of tenure insecurity and perceptions of tenure security at a national level. The questionnaire was reviewed by Prindex’s Technical Advisory Group (TAG), which includes representatives from the academic and civil society research communities with considerable individual and institutional expertise in researching tenure issues and designing perception-based survey instruments. The questionnaire has also been tested through multi-country testing rounds to assess the distribution of responses to individual questions and covariation with other answers. These helped identify the most consistently robust questions and remove redundant ones from the questionnaire. Test rounds have also been used to compare the effects of increasing sample size and the number of sampling units, and identify meaningful subgroup differences (e.g. gender, age or education). Translate the questionnaire into the local language(s). For data collection in 2018, using two data research companies (Gallup and CrossTab), enumerators conducted face-to-face or telephone interviews in each country among a nationally representative sample of people eighteen years or older with a total sample of over 53,000 respondents over 33 countries. 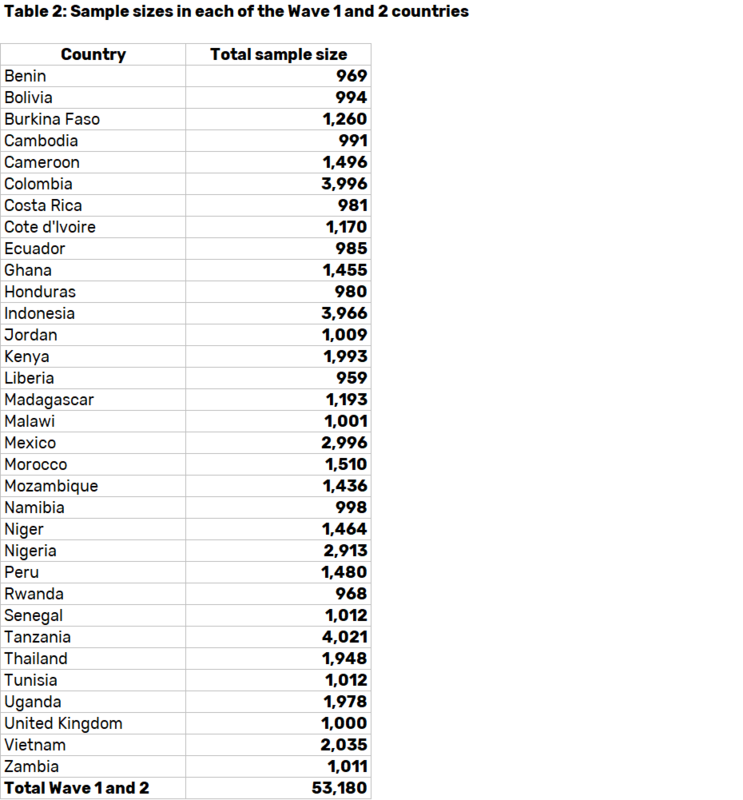 See Table 2 for final sample sizes in each country. In all countries except the United Kingdom, a multistage stratified cluster sampling approach was used to select respondents using the latest available census data. In the United Kingdom, surveys were conducted over the telephone and respondents were selected from national landline and mobile phone lists. You can find more information about our sampling strategy here. As we aim to interview a representative sample of the adult population, not the head of household or the most knowledgeable person about the dwelling or land, we used a randomisation process to select which household adult was interviewed. This process also ensured an equal-as-possible probability that a female respondent was interviewed. Interviewing individuals allows us to present results for both men and women, and young and old people, and compare their situations. 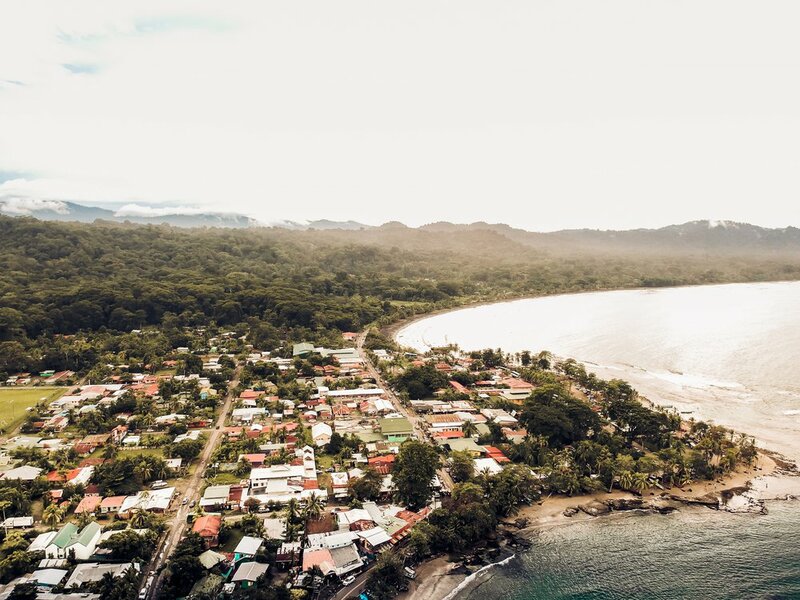 In 2019, we aim to collect data from over 100 countries in total, including Prindex’s tenure security perceptions module in the Gallup World Poll. This will also enable us to combine the Prindex data with an even wider range of data in the World Poll to allow us to analyse which variables are most closely associated with perceived tenure security.